Today, we bring you an interview with Somesh Gaur, editor of Housing Bubble Bust, which takes a quantitative approach to understanding housing prices. The site also offers an excellent “Anatomy of the Housing Bubble” and data feeds on everything related to the housing market. Today, we bring you an interview with Peter Peter Giardini of Bigger Pockets. Pete is a successful real estate investor who started with $25K in 2001 and has never looked back. He took full advantage of the “craziness” of the market and sold his entire rental portfolio at the very top in 2006. In addition to his own investing, Pete founded The Club, LLC, a real estate investing coaching program that focuses on strong relationships, accountability, one-on-one coaching and strong local resource networks. Pete can also be heard every Thursday night at 11PM on his radio show. As part of our continuing series, today we bring you an interview with John M. of Housing Doom, who despite not yet having achieved macroeconomic enlightenment, was one of the first bloggers to spot the housing bubble, and comment on the impossibility of getting “something for nothing.” Enjoy! If used properly, mortgage assumption can provide valuable benefits for both the buyer and the seller. If used improperly, however, they can be a bane for both parties, as well as illegal. Let’s start with the basics: What is meant by the term “assumed mortgage?” In a nutshell, the assumption of a mortgage is just what it sounds like- the transfer of all liabilities associated with a mortgage from one party to another. There are several variations, but it basically refers to a situation in which the buyer of a home assumes the existing mortgage from the seller, in lieu of taking out a new mortgage. The benefit of such an arrangement is cost savings. Especially if interest rates have risen in the interim (i.e. in the time that has elapsed since the mortgage was initially obtained), the savings can be significant. Even with significant changes in interest rates, there are savings associated with not having to pay closing costs associated with obtaining a new mortgage. A buyer whose credit is less than stellar meanwhile, can avoid negotiating with a bank, and instead negotiate directly with the seller. Typically, any savings are shared between the buyer in the seller, and are simply tacked on to the price of the home. Historically, mortgage assumption was only ever popular during times of interest rate uncertainty, namely the 1980’s and early 1990’s. At that time, many mortgages were assumed privately. In other words, the transfer was negotiated directly between buyer and seller, without the knowledge of the lender. Such mortgages are often structured as wraparounds, whereby the original mortgage is maintained by the original borrower, who receives payment from a new homeowner at a spread to the original borrower. Nowadays, such assumptions have become the exception, since lenders have caught on and inserted due-on-sale clauses into mortgages, which essentially required them to be repaid in the event of a change of ownership on the underlying property. Failure to notify the lender of a mortgage assumption, in such a case, qualifies as mortgage fraud. Some lenders have become more amenable to mortgage assumption, such that they are willing to honor a transfer to a new borrower without assessing fresh closing costs. The catch is that in the process, the interest rate is ratcheted up to conform with prevailing rates. [Otherwise, the lender would deprive itself of the income that it could earn from charging a higher rate]. It should be noted that FHA and VA loans are always assumable, although those originated after 1989 require the approval (and payment of certain fees) of the lender. If private mortgage assumption strikes you as incredibly risky, that’s because it is! While a public (i.e. lender-approved) assumption relieves the original borrower of all liability, private mortgages are off-the-record (and often illegal) and hence must be resolves directly between the two parties involved. Failure by the new borrower to make timely payments would place the original mortgager in the awkward position of playing landlord, perhaps to the point of executing a form of foreclosure. Meanwhile, mortgages that are assumed multiple times still leave the borrower (and his credit rating) on the hook until for as long as the mortgage remains existence, as one borrower learned the hard way. In today’s ultra-strict lending environment, chances are you won’t ever have to deal with mortgage assumption. Given that rates are projected to begin rising, however, it could conceivably experience a modest surge in popularity. Still, for the average borrower, it’s not something worth considering. As part of a new series, the Mortgage Calculator will begin interviewing other housing columnists/bloggers. The following is our first interview, with Patrick Killelea of Patrick.Net, one of the most widely read blogs on the housing crash. Mortgage Calculator: Given the sub-title of your blog, is it fair to say that you believe the housing market hasn’t yet bottomed? Yes, I think the housing market has much further to fall on the coasts and in expensive areas. But in some poor neighborhoods, prices have fallen back into line with rents already, meaning that it’s about the same to rent or buy there. So those poor areas seem close to a bottom. Mortgage Calculator: You write that when interest rates rise, housing prices generally fall. How do you square this with the notion that interest rates will probably rise when there is evidence of an economic recovery, at which point borrowers will be in better positions for buy expensive homes? Prices on the coasts are so far beyond the range of the median salary that any small increase in salary is insignificant compared to small increases in interest rates. It is still common for borrowers in California to have ten times their annual income in debt. They can pay their mortgage only at extraordinarily low adjustable interest rates, and only until the mortgage resets. A reset from 4% to 6% means 50% more interest every month. Mortgage Calculator: Do you think, then, that when the Fed finally raises rates, that home prices will start to once again fall? Start once again? Not sure what you mean there, since prices are still falling right now. For a realistic view, avoid all news which quotes used-house salesmen (realtors) because they will say anything that parts fools from money. But yes, rising rates will definitely push prices down even more. Mortgage Calculator: Given the lopsided relationship between housing prices and rental rates, do you that it makes sense for real estate investors to look at buying rental properties? Only in poor neighborhoods, so far. You can easily calculate the annual rent to purchase price ratio and see what kind of gross return you can expect as a percentage. Returns in wealthy areas are too low to justify the high prices, about 3%, but there are poor parts of Oakland, for example, where the return is over 10%. Mortgage Calculator: On a related note, do you generally believe that renting is more economical than buying, even when the ratio of rent to home prices is more in line with long-term averages? No, if you think about it for a minute, you see that renting must have been more expensive historically than owning, or landlords would have gone out of business. If their mortgage and expenses are $2000 per month, but the tenant is paying $1500 per month in rent, the landlord is losing money. The basic theme of my site is that that relationship is inverted now, and landlords in middle-class and better areas are giving a huge gift to renters. It’s a fantastic time to be a renter. You get the use of a house for free, paying only the property tax and maintenance. Mortgage Calculator: You pointed to appraisers as facilitating the rise in housing prices, because of the way they are incentivized. Recently, there have been reports that appraisers are dragging their heals in the opposite direction, wary of fomenting another bubble in housing? Do you think these reports tell the story? How do you think this will changed as a result of the new laws which require appraisers be appointed directly by the lenders? No, I think all those stories about appraisers dragging their heels are just the used-house salesmen complaining that appraiser honesty is putting a damper on their business. The business of realtors is deception. Honesty doesn’t sell houses. But I have little faith in those laws. There is so much money to be made by fleecing buyers that realtors will find ways to eliminate the honest appraisers. The NAR (National Association of Realtors) is one of the biggest lobbyists in DC, and lobbyists literally write the laws and hand them to congressmen these days. The NAR will find a way to defeat honest appraisals unless we have sweeping campaign finance reform. Mortgage Calculator: Many analysts have argued that the apparent stabilization in the housing market is being supported by a glut of first-time buyers, driven by the government’s $8,000 incentive plan. You wrote recently, however, that there is “Shortage of first-time buyers.” Can you explain? Everyone who could afford a house already bought one. And then people who could not afford a house bought one too. And then the builders kept on building. New people do come into the market, but compared to the saturation level, there are just not that many first-time buyers. No glut. The $8,000 tax incentive did nothing but keep prices $8,000 higher than the market would have set. Those who bought with that incentive actually got no benefit. The real solution to help buyers is the lower prices that the market would set based on rents and salaries. But that harms banks, and banks are also big lobbyists in DC. So the incentive was an $8,000 per-sale gift to banks, not to common people. So again, corporate control of government is being used to part people and their money. Campaign finance reform would help. Mortgage Calculator: What do you think it will take for people to accept the notion that home prices don’t appreciate much faster than the rate of inflation, over a long-term period of time? They have to grow up seeing that fact in front of them every day. The Japanese now have seen 15 years of continuous residential real estate declines. I imagine the psychology is finally changing there. It would also help if there were an open market in real estate, where every bid had to be validated by a bank, and published in the papers. Realtors lie about bidding wars all the time, but because bids are not public, they get away with it. Mortgage Calculator: How would you reconcile government and seller incentives and low interest rates with the possibility that home prices could fall further, when advising someone thinking about buying their first home? Would you advise them to buy, wait for a while, or wait forever? They should wait if renting is cheaper than owning at a 30-year fixed mortgage rate. And they should wait if the debt they are thinking of taking on is more than 3 times their salary in a secure job. If rent would be significantly more than owning that same thing, then it makes sense to buy. Also, if someone has the cash on hand, or if they have a much larger secure income than is needed to service the expenses, then it’s also OK to buy if they plan to stay there a long time. The entire goal is not to waste life as a debt-slave. But it takes independent thought and determination to avoid that fate. Determining the size of one’s down-payment is more complicated than it would seem. Historically, the prevailing wisdom regarding down-payments was the larger the better. During the inflating of the housing bubble, however, this logic was turned on its head, and it was even possible to take out a no-money down mortgage. As it turns out, there are advantages and disadvantages to both approaches. Personal finance columnists usually advise a down-payment of 20% Loan-to-Value (LTV). In other words, take the size of your mortgage, multiple it by 20%, and VOILA, you have your down-payment. According to their reasoning, 20% is substantial enough both to demonstrate your creditworthiness to the lender and to cushion you from negative price swings in the value of your home. Given the decline in housing prices, however, it’s perfectly conceivable that borrowers that made 20% down-payments are still underwater in their mortgages. After a foreclosure, then, such borrowers will be left with stains on their respective credit report, and gaping holes in their personal assets. From the lender’s perspective, meanwhile, such borrowers are actually considered less credit-worthy than those that make the minimum required down-payment. For those of you scratching your heads: It turns out that those who make down-payments between 20-25% are actually more likely to default. In addition, such borrowers aren’t required to purchase private mortgage insurance, further increasing the cost of default to the lender. The cost of private insurance, then, can actually be recouped in the form of lower interest rates! In other words, there isn’t much of a financial penalty (sometimes even a reward!) for making a smaller down-payment. Some financial planners now encourage making the smallest allowable down-payment, based on the reasoning that borrowers can then set aside extra money in an emergency fund, making it less likely that they will become delinquent (miss payments) on their mortgage further down the road. What is the minimum down-payment? Well, that depends on the loan, and the lender. A Federal Housing Administration (FHA) loan requires a 3.5% down-payment. [However, proposed legislation would increase this to 5%]. For veterans, or those that live in rural areas, there are VA home loans and Guaranteed Rural Development loans, respectively. For those still struggling to scrape together the cash, there are a few more options available to you. First, you can talk to your lender and try to pledge securities in lieu of making a down-payment, but be advised that such is tantamount to borrowing money to buy stock. Second, if you already own the land that your home is (being) built on, that may qualify as a down-payment. Third, you can appeal to family/friends for help, but be aware that the lender will demand proof that any such assistance is a gift, rather than a loan. Finally, you might try talking to the seller, and asking him to help you make your down payment (offset in the form of a higher sale price). This will only be possible, however, if the sale price initially exceeded the appraised value. All else being equal, a larger down-payment should translate into smaller monthly payments, as a result of both lower principal and interest. It should also lower your mortgage insurance premiums. As I noted above, however, some lenders actually penalize those who make larger down-payments. Ultimately, every situation is different, and it probably makes sense to use calculators to crunch the numbers associated with a few different scenarios to see ultimately which one makes the most (financial) sense for you. Over the summer, the Government Accountability Office (GAO) released a report on the IRS handling of the Home Mortgage Interest Deduction. Despite being published with little fanfare, the report was widely circulated and could lead to big changes to the tax treatment of mortgages. As almost everyone who takes out a mortgage is certainly aware, mortgage interest payments are tax deductible, which means the actual interest rate paid by the borrower is often significantly lower than the rate quoted by the bank. [The precise discount depends on one’s tax bracket]. However, the understanding of most borrowers doesn’t extend much beyond this, which is problematic because it turns out mortgage-related tax matters are actually quite complicated. For example, the tax benefit can only be claimed on mortgages under $1 million, and cannot generally be increased as a result of a refinancing, unless the proceeds are used to improve one’s home. Points, which are used to buy down the interest rate when the mortgage is first issued, are deductible in the year they are paid, as are loan origination fees. Lender fees, private mortgage insurance, and other settlement costs cannot be deducted. As for home equity loans, the limit is $100,000. Paradoxically, the proceeds from a home equity loan cannot be used in relation to the home in order to be eligible for the deduction, but can be used for almost anything else, from credit card payments to school tuition, etc. If the borrower is subject to the Alternative Minimum Tax (AMT), however, the opposite applies, and the proceeds MUST be used towards the improvement of the home in order for the interest to be tax deductible. Confused yet? If so, the chart below represents the best summary of the IRS rules I have ever come across and should be a great reference when it comes time to file your taxes! The IRS doesn’t make things easier. 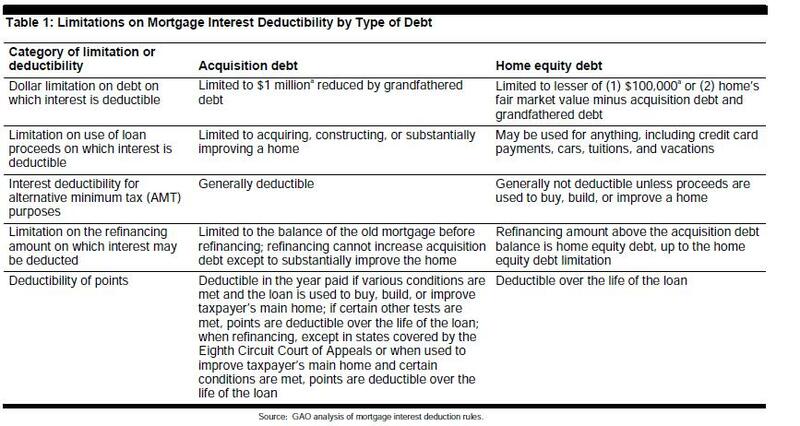 According to the GAO assessment, taxpayers have to go through as many as 13 steps to determine first whether mortgage interest is tax deductible, second whether points are deductible, and third the size of any deduction. Included in the official tax forms is a handy flow chart, which borrowers can theoretically use to complete these steps. However, the increasing majority of taxpayers that use tax preparation software to file probably doesn’t ever see this chart. To make matters worse, the GAO report found that such software uses inconsistent methods to determine tax detectability, sometimes even asking the borrower to make the determination/calculation himself. The main purpose of the report was to assess the ability of the IRS to properly determine and manage mistakes in mortgage tax issues, and in this aspect, the report was scathing. Due both to inadequate resources and insufficient information about taxpayers’ mortgages, mistakes were often allowed to slide. Although, the GAO found that the claimed deduction was understated as often as it was overstated, so the net result is probably a wash for the government. In any event, it seems clear that something has to change. Either the IRS has to streamline paperwork associated with the mortgage tax deduction, or the government needs to revamp the rules. When you consider that the deduction costs the government $80 Billion in foregone tax revenues per year – especially in the context of the current budget problems – this could conceivably become a major political issue. Here at the Mortgage Calculator, we try to provide timely updates on the government’s loan modification program. It has many shortcomings, which are responsible for the program’s dismal 9% participation rate. Since then, we’re happy to report that the program has really taken off, as the largest lenders have been shamed by the federal government into submission. There are a few reasons for these outcomes. First of all, when executing loan modifications, lenders can choose between lowering one’s interest rate (temporarily or permanently), extending the loan term, and cutting principal from the loan amount. In theory, all would seem to lead to lower payments, but as the statistic above attests to, this is the case less than half the time, due primarily to the adding back of deferred taxes. Astonishingly, over 90% of loan modifications lead to higher principal balances. Those on the other side of the debate argue that this misses the point, and that the focus instead should be on “permanent debt reduction.” Many have begun to direct their attacks on the industry’s Net Present Value model, which is used to asses whether a loan modification is ultimately in the best interest of the lender. According to critics, this model is overly conservative, and leads to an overly high rate of rejection. At the very least, it confirms what cynics have maintained all along- that the mortgage lending industry still does not remain behind the loan modification program. There’s even a small minority of critics who insist that loan modifications are a bad deal, on the grounds that it damages the credit of borrowers. “Under reporting guidelines set forth by the credit bureaus and the Consumer Data Industry Association, your loan modification will be reported as a ‘Partial Payment Plan.’ Under the FICO scoring method, that designation will lower your credit scores, even if you have never missed a payment.” From a credit standpoint, then, loan modification is not much different from foreclosure that far away from foreclosure, and might ask some to consider whether the consequences justify it. Outside of this debate are the millions of people still waiting to receive modifications. For every borrower that is emerged “victorious” from the maze of requirements, there are at least 10 more who are stuck in “loan modification hell,” as one columnist put it. Anecdotal reports indicate that the experience is both time-consuming and frustrating; the best advice is to be patient, and to keep a paper-trail. When filing a mortgage application, you will be required by your lender(s) to submit certain documentation, in order to prove both your income and your assets. While your lender will most likely inform you of specific requirements, you can save yourself precious time by preparing all of the documents in advance. In terms of proof of assets, you should begin by compiling information on all of your bank accounts, including account numbers, the branch address(es), and copies of recent statements. Remember to include information for both checking and savings accounts. You should also plan on furnishing statements of other liquid assets, such as IRA retirement accounts, CD’s, annuities, and estimated cash value of life insurance policies. It wouldn’t hurt to provide valuations for Illiquid assets (real estate, valuables). The next step is to document your income. This is best achieved through the provision of pay stubs, W-2 withholding forms, and even recent tax returns. If you are self-employed, you should prepare audited income statements for your business. Generally, lenders won’t require more than two years worth of data, but in some cases, they may request additional information. Even if your creditworthiness has been established (and especially if it isn’t), it wouldn’t hurt to show timely payment of rent and utilities for the last 1-2 years. Your lender will also need to see and legal documents/filings (related to divorce, etc.) in order to determine if any potential liabilities exist. Prior to the bursting of the housing bubble, it was possible to obtain a competitively-priced loan without providing any or all of the documentation listed above. Reacting to lending standards that were perhaps overly stringent, lenders gradually loosened their requirements. This led to lender complacency and the consequent proliferation of so-called liar-loans, which describe mortgages that require little or no documentation. In some cases, it is still possible to obtain such loans. Some lenders will accept stated income and/or assets (as opposed to verified income and assets), but you can expect the spread to full documentation loans to be higher than before. According to a recent report, “Less-documented borrowers who reported high incomes were far likelier to default than those whose high incomes were verified – suggestion that loans were made on misleading information.” The report found that applicants were likely to overstate income by 20% on average when verification wasn’t required. For some applicants, namely those who are self-employed or in-between jobs, a low-documentation loan might still be the best choice. No-ratio loans, whereby income and assets are verified but not used to calculate typical do-not-exceed ratios, might be necessary for those who want to purchase houses that are technically unaffordable. Of course, you should speak to a loan officer before deciding whether a low-documentation loan is appropriate for you, but it helps to know your options before going in. The report also compared differences between well-documented borrowers and those who didn’t need to verify their incomes and histories and loan documents. It found that the less-documented borrowers who reported high incomes were far likelier to default than those whose high incomes were verified – suggestion that loans were made on misleading information. The federal government’s homebuyer tax credit has been a boon for both the housing industry and the housing market, causing a surge in sales over the last few months. In fact, the program has been such a success, that some states are now introducing their own versions, and stakeholders are lobbying both to expand the federal program and to extend its deadline. In its current form, the “tax credit is equal to 10 percent of the home’s price, up to $8,000. So, for example, if a buyer is paying $50,000 for a house, the credit would be worth $5,000. The tax credit never has to be repaid. Last year, Congress created a different tax credit, but that one was effectively an interest-free loan. This money involves no repayment or interest…Buyers will get the money when they claim the tax credit while filing their federal income taxes for 2009.” If a taxpayer owes less than the tax credit he is due, then he is still entitled to receive the difference. Given that the program is slated to expire on November 30, several lawmakers have already moved to legislate an extension. In fact, there are two bills currently winding their respective ways through Congress: “H.R. 101, The Economic Recovery Through Responsible Homeownership Act of 2009, which would provide up to $10,000 in tax breaks to any homebuyer who makes a qualifying down payment and H.R. 1245, the Homebuyer Tax Credit Act of 2009, which would provide a tax credit of up to $15,000.” The Senate is currently working on developing similar legislation. Another change could affect borrower eligibility. With the current credit, “Congress set an income limit for the full credit. For a single person, it’s $75,000 and for married couples, it’s double that.” With the extension, it’s possible that these income limitations (and maybe even the requirement that the credit be applied towards a first-time home purchase) could be eliminated, in order to make the credit available to more people. Meanwhile, the federal government is not the only one working overtime on this issue. New York recently became the first state (that I know of) to implement a similiar program, which “would allow home buyers to take a dollar-for-dollar deduction of 20 percent of mortgage interest paid, Gov. David A. Patterson and other state officials announced. The remaining 80 percent of the mortgage interest paid for the year will be treated as usual, as itemized tax deductions.” For some borrowers, this could amount to savings in excess of $1,000 a year. Not a bad deal, especially when you factor in the federal money. It will be interesting to see if other states follow suit, and we’ll keep you posted as this story unfolds.